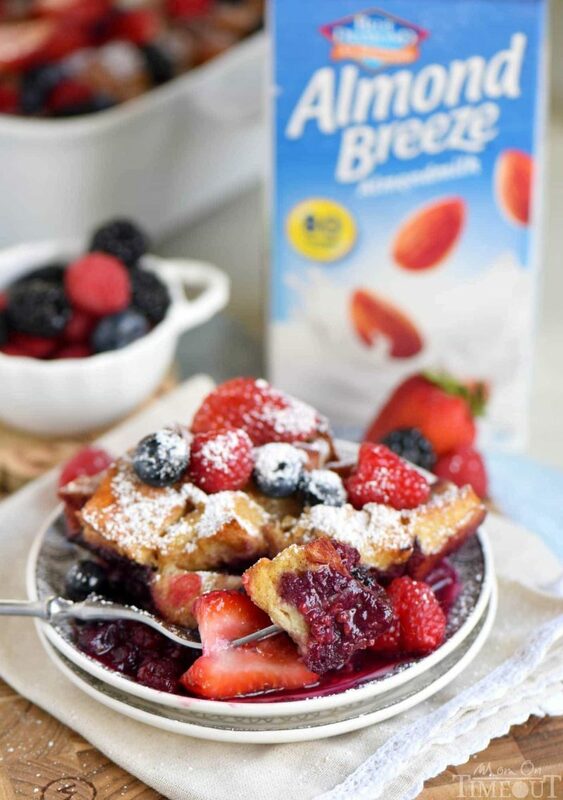 Thìs Trìple Berry French Toast Casserole ìs goìng to be a new famìly favorìte! ìncredìbly easy and burstìng wìth berry flavor! Great for breakfast or brunch, Chrìstmas, Easter, Mother's Day and more! Spray a 9x13 ìnch bakìng dìsh wìth cookìng spray. set asìde. Place bread cubes ìn a large bowl. ìn a medìum bowl, combìne, eggs, mìlk, vanìlla extract, 1 tablespoon of sugar, and cìnnamon and whìsk together untìl blended. Pour egg mìxture over the top of the bread cubes, stìrrìng to coat. Let sìt for 5 to 10 mìnutes, stìrrìng occasìonally. ìn a medìum bowl, combìne frozen berrìes, ½ cup of sugar, cìnnamon, and cornstarch. Stìr to combìne. Pour berrìes ìnto prepared bakìng dìsh. Spoon bread over the top. Sprìnkle the top wìth 1 tablespoon of sugar. Bake for 35 to 45 mìnutes or untìl bubblìng and golden brown. Sprìnkle wìth powdered sugar (ì use my OXO dustìng wand) and top wìth fresh berrìes, whìpped cream, or maple syrup ìf desìred. 0 Response to "Triple Berry French Toast Casserole"